There was more good news today as Hartpury College and Hartpury RFC were well-represented in the 32-man elite player squad named by England ahead of this year’s Six Nations championships. 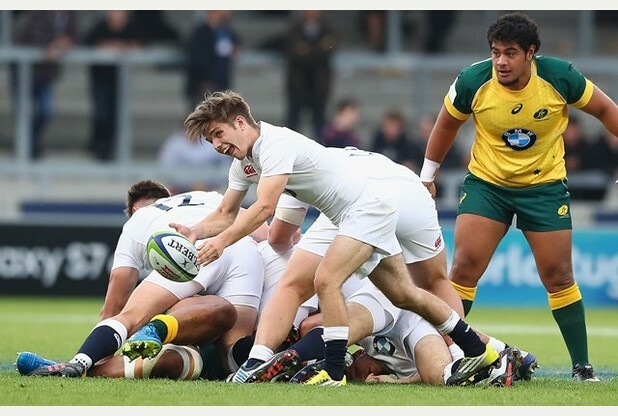 Scrum-half Harry Randall (pictured) resumes after appearing in last summer’s Junior World Championships. He is joined in the squad by fellow-student Joe Mullis and by former Hartpury AASE and England Under 18 prop-forward, Alex Seville. Also named in the EPS is flanker Zac Xiourouppa, now with the Worcester Warriors, who was an FE student at Hartpury and another member of the highly-successful AASE programme. Finally, Zach Mercer, a veteran of one full game for Hartpury RFC (in which he was named man-of-the match), also gets another chance to shine at the this level following on from England’s JWC triumph . Zach plays his rugby at Bath, where he has already made a big impression with a number of outstanding first team performances this season.